Firefly S10 Lite Announced! 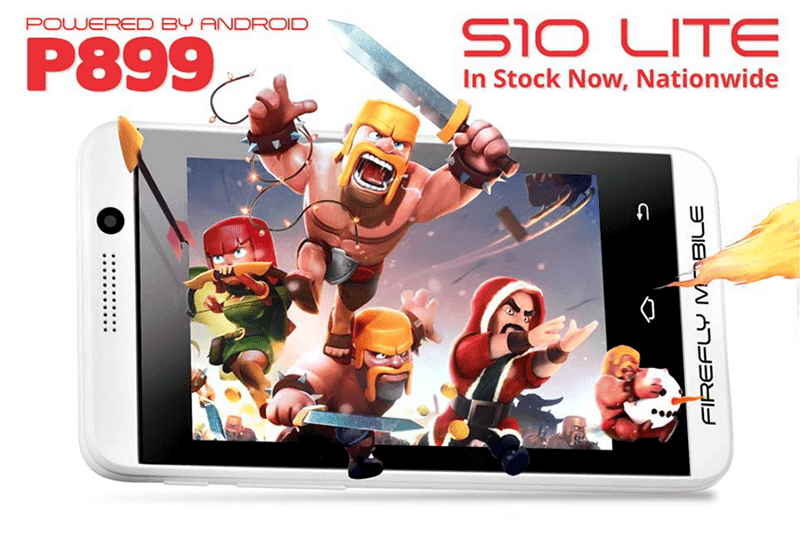 The Most Affordable CoC Capable Phone In The Land At 899 Pesos! Home / firefly mobile / firefly mobile s10 lite / firefly s10 lite / firefly s10 lite price / firefly s10 lite specs / mobile / news / Firefly S10 Lite Announced! The Most Affordable CoC Capable Phone In The Land At 899 Pesos! Firefly Mobile has a special treat for everyone this Christmas! They just announced the Firefly S10 Lite, possibly the most affordable Android smartphone in the land today. Dubbed as the CoC (Clash of Clans) capable phone, this handset features a modest 3.5 Inch "Super Brite" screen, 1 GHz processor, 256 MB RAM, 256 MB ROM and 1,400 mAh of battery. It also has WiFi connectivity together with dual SIM connectivity and GPS. The S10 Lite also comes with a free screen protector and 12 months of warranty for your peace of mind.